Description: With some of the longest tail feathers in the world, the reeve’s pheasant is easily recognized. Also known as the long-tailed pheasant, the male reeve’s pheasant has golden brown feathers, each edged with black, over the body which extends into a barred tail of the same colours. The head is white with a bold black mask and black collar. Female reeve’s pheasants are smaller and mottled light brown with a distinct brown bar behind the eye. 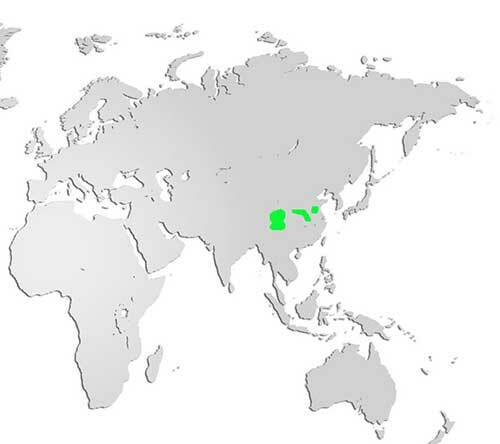 Distribution and Habitat: The natural habitat of the reeve’s pheasant is in the mountains of central China. Diet: Omnivores, reeves’s pheasants forage for seeds, flower buds, earthworms and grubs. They have been known to graze in cultivated fields of beans, grain, and root crops. Life Cycle: Usually monogamous, these pheasants live in small flocks except during breeding season in which the males set up territories and guard them diligently. Female reeve’s pheasants make a nest in grass or under a tree, lay a clutch of 6 to 10 eggs and incubate them on their own for about 25 days. After hatching, chicks stay close to their mother and learn to forage from her. Did you know? 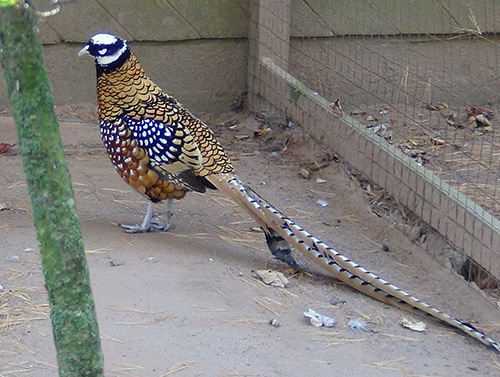 In the past Reeves’s pheasant was hunted for its tail feathers, which were used in Peking opera costumes.